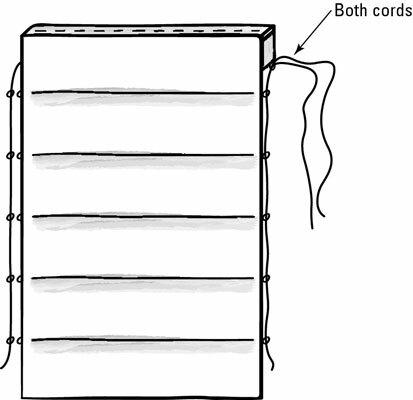 Roman shades pull up in sections with the help of a traverse cord or Roman shade cord (both available at a crafts store). Roman shades look elegant and streamlined in either the up or down position. You’ve probably seen Roman shades starting at $65 or $75 apiece in window treatment catalogs. By following these instructions, you can create a Roman shade without most of the characteristic hassle (and for much less of the cost). This shade mounts above the top of the trim mold and descends to the windowsill, so keep this in mind when planning and measuring. You’ll need to divide your cord in two. One piece should measure the height of your window plus the top length plus a few inches, because you’ll be threading that piece of cord up the left side and over the top to meet the other cord on the top-right side of the shade. The other piece should measure the height of your window, plus a few inches. The length of the wood needs to be the same as your window’s width. 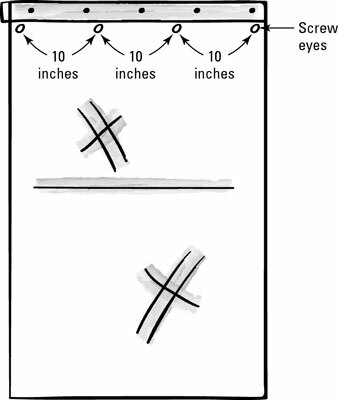 Cut your fabric to the appropriate size. For a 30-x-60-inch window, use a 32-x-76-inch piece of fabric. Hem the sides of your shade fabric by pressing the fabric on each side 1/2 inch and folding in another 1/2 inch, and then sewing along the edges. Hem the bottom of your shade by pressing the fabric 1/2 inch and folding up 2 inches, and then sewing along the edge. 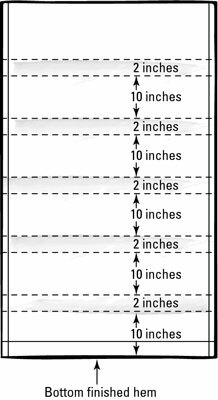 From the bottom finished hem of your shade fabric, chalk lines across the front; measure up 10 inches and mark, and then measure another 2 inches and mark. Continue this pattern to the top. You have five sets of lines that are 2 inches apart. With your sewing machine, stitch the lines that are 2 inches apart together, creating small sleeves in the back of your shade. With a hammer and nails or screws, attach your 1 x 2 board above your window. On the underside of the board, attach four screw eyes, allowing for 10 inches between each one, regardless of your window size. Using your staple gun, attach the top of your shade to the top of the 30-inch board. Make sure that you fold the fabric under at the top, and check that the shade reaches the bottom of your window. Attach screw eyes to the ends of each dowel. Insert the dowels into each sleeve. 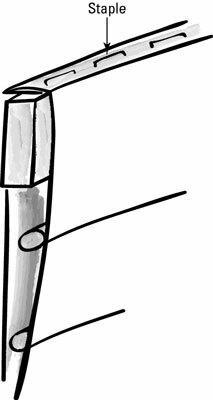 On the left side of your shade, tie your cord to the bottom screw eye and then weave the cord through the screw eyes along that edge. Thread it up through the four screw eyes above it and through the screw eye at the bottom of the mounted board, bringing the cord to the right side. Repeat on the right side, threading through the screw eyes in the dowel rods, and attach the cord from the left side to the cord from the right side and knot well. Now attach the cleat to the wall on the right side of the shade so that when you draw the Roman shades, you can wrap the cords around the cleat to keep it in place.